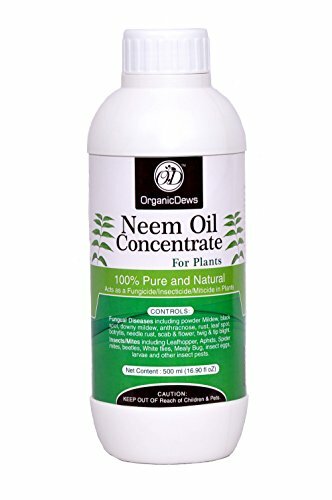 100% Pure and Natural Neem Oil (Concentrate) for Plants – Acts As an Insecticide/Fungicide/Miticide – Extracted By Cold Pressed Method – Contains 3000 PPM Azadirachtin Which Repels/Control Aphids, Black Spot, Rust, Spider Mites, Fleas, Fungus Gnats, Whiteflies, Mosquito and so on – Perfect to Use on Indoor/Outdoor Plants – Guarantee That All Harmful Plant Eating Insects, Fungus Are Controlled And Allowing the Plants Grow Happily and Healthily. Is Plant Eating Insects and Fungus invading your garden?? Don’t worry you can easily defeat them naturally without using any harmful chemical insecticide and Fungicide. The Solution is Neem Oil. Naturally Neem oil has the more than 40 different active compounds. In which Azadirachtin is the main active ingredient to repel and kill plant eating insects and fungus disease. When the plant eating Insects eats the treated plants with neem oil, their hormonal system is disrupted which prevent the insects from growing, feeding and breeding. Hence controlling their life cycle. Neem oil concentrate for Plants has been extracted from the neem seed kernels using the Indian Traditional way (i.e) cold pressed method, hence retaining all the well balanced nutrients within itself and then triple filtered to remove the residues. Controls Fungual Diseases including powder Mildew, black spot, downy mildew, anthracnose, rust, leaf spot, botrytis, needle rust, scab and flower, twig and tip blight and alternaria. Controls Insects/Mites including Leafhopper, Aphids, Spider mites, beetles, White flies, Mealy Bug, insect eggs, larvae and other insect pests. 1. It is emulsifiable, Eco-friendly, bio degradable. 2. It helps in maintaining environment health by reducing the level of pollution. 3. Harmless to plants and maintain the stability of soil fertility. 4. It also reduces human and animal hazard by reducing the level of residue in the product. 5. It reduces risk of plant failure and increase crop yield by 15-20%. 6. Unlike chemical it saves environment without pollution. 100% Pure and Natural Cold Pressed Neem Oil (Concentrate) for Plants. Acts as an Insecticide / Fungicide / Miticide. Neem oil is emulsifiable, eco-friendly, bio degradable. For Indoor/Outdoor Use on Fruits, Vegetables, Nuts, Herbs, Spices, roses, Houseplants, Flowers, Trees, Lawns and Shrubs.